Melissa Strain, marketing manager for William & Mary Dining Services, said she was “blown away” when told that one of the men in her department, Guy Brown, has logged 60 years at the university. Brown’s ability to connect with everyone on campus, regardless of their station, has been so powerful that when some alumni return to campus, they visit Brown. There’s an attorney in Richmond who once brought his family down to meet Brown. Perhaps he savored the memory of Brown’s roast beef and mashed potatoes, his specialty and a favorite with students for decades. “They tell me it’s real good,” Brown said, as though he’d never eaten any himself. Brown points to his head when asked what makes it so tasty. Hundreds of William & Mary employees will be celebrated at a June 14 service awards ceremony at the university for reaching milestone work anniversaries, from five to 60 years. Brown stands alone at the top of that list, followed by Betsy Croswell with an impressive half-century at William & Mary. Four employees are celebrating 40-year anniversaries at the university: Juanita Achols, Mary Anderson, Scott Fenstermacher and David Tidwell. Brown was still in high school in 1955 when he began working in the kitchen at Trinkle Hall, then the university’s main cafeteria. Two of his brothers, already working at Trinkle, taught him how to cook, and for three summers he honed those skills at a YMCA summer camp in New York. 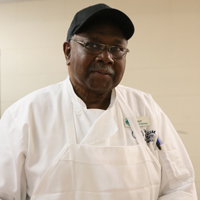 Brown likely has worked every job imaginable in Dining Services: busboy, dishwasher, chef from 1959 on and, now, prep cook. In that capacity, Brown cuts approximately 1,200 pounds of meat per week, as well as helping with produce production. Working at W&M has been a family experience. In addition to his brothers, Brown met his wife, Gertrude, early in his career at W&M. She worked for what then was called the Wigwam, now known as the Marketplace. Brown will continue to leave his mark when he does finally retire. He has trained some of the young chefs, teaching them recipe formats, portions, even different styles of cooking. Meanwhile, across campus, Croswell has completed her 50th year at the university, a journey that has taken her from W&M’s Virginia Marine Science Institute (VIMS) to James Blair to the Bryan Complex to Jones Hall to the Chancellor’s office and, for the last decade or so, to Blow Hall and the registrar’s office, where she works 29 hours a week. 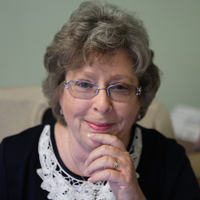 Her job title is “Customer Service Representative,” a role she said that encompasses dealing with any and everyone: students, parents, alumni, faculty, staff, townspeople seeking class information and out-of-towners seeking information about the university. Croswell’s affection for William & Mary is real and deep. But her heart stands closest, she said, to the Raymond A. Mason School of Business and its MBA program. Crosswell said she hopes to help the business school with its upcoming 50th anniversary, sending out letters to alumni, including personal notes and encouraging them to return to campus. It’s that type of dedication that has made her an extraordinary employee.